Presented to City Council at their September 16th meeting by Better Boulder Co-Chair Will Toor. I would like to express my appreciation that Councilman Weaver has withdrawn his proposal for a development moratorium. Right now, Denver is celebrating Start-up Week; it would be a real shame if this was shut-down week in Boulder. However, we also urge council to reject the proposed resolution on a comprehensive development plan. Recently there has been talk of a “development binge” in Boulder, even though the construction we are seeing today in our Downtown and the new Boulder Junction area to the east are consistent with the existing Boulder Valley Comprehensive Plan, and its vision for Boulder to be a compact, walkable community. We are seeing a fair amount of construction today because projects piled up while we were in the recession. According to the Boulder County trends report, Boulder only grew by 1,000 people from 2,000-2010, about 0.1% per year. And the reason often cited to fear infill – worsening traffic – is also flat. VMT has been flat for 20 years, and careful measurements by the city show that the amount of time it takes to drive across town have also been flat. Our transportation programs are working, as Boulder residents drive far less than the regional average. Boulder needs vibrant places for people to walk, bike, live and work. 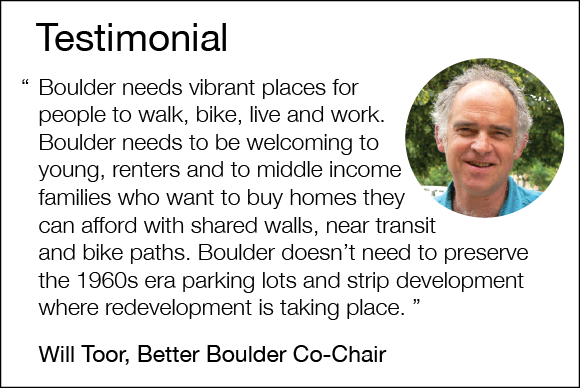 Boulder needs to be welcoming to young, renters and to middle income families who want to buy homes they can afford with shared walls, near transit and bike paths. Boulder doesn’t need to preserve the 1960s era parking lots and strip development where redevelopment is taking place. The projects getting built now were vetted and approved by many of our current city council members either while on council, or while serving on Planning Board. The Boulder Junction area in particular had about as exhaustive a planning process as could be imagined, lasting at least 7 years. The region has invested a huge amount in getting the US-36 bus rapid transit corridor built, and it’s due to begin service in about a year. Shouldn’t Boulder develop in a way that takes advantage of that investment? Shouldn’t we put good jobs and dense housing within walking distance of our most important transit lines? And Boulder residents care about climate change. The data is overwhelming – the per capita energy use and GHG is far less in denser areas near transit. If we are serious about our climate goals, we should embrace infill. Many of the objections we’ve heard have to do with the aesthetics and design details of some of the larger projects going up today, and many of us agree: they could be improved. We hope future projects can inspire our community’s love, create human-scale urban spaces and appeal to pedestrians at eye level. Better Boulder welcomes a robust and inclusive discussion of our city’s physical form, population density, and urban design details. Boulder already has a well defined community process for talking about larger scale land use, growth, and development issues. It’s called the Boulder Valley Comprehensive Plan. It gets revised every 5 years, and we’re due to update it in 2015. The scoping of that process begins next month. Rather than adding yet another layer of process, let’s use the upcoming 2015 Boulder Valley Comprehensive Plan update to address the issues being raised. We’re looking forward to the lively conversation! Let’s work together for a better future — not try to stop the future in its tracks.